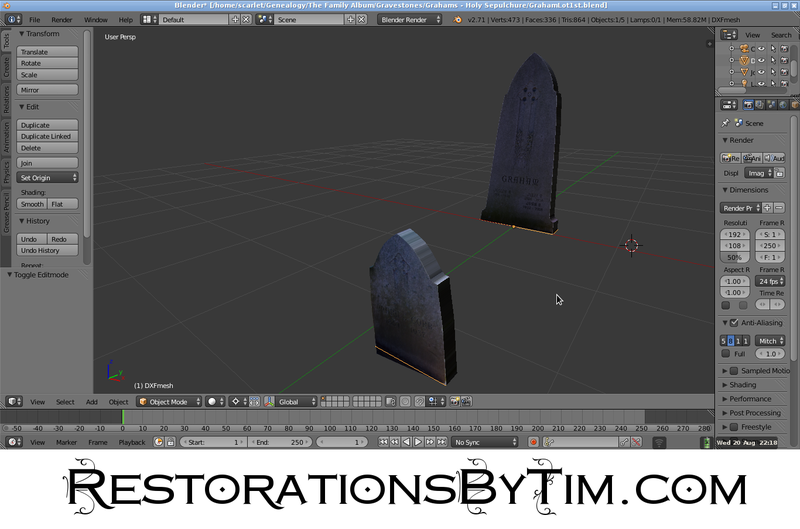 Mapping and Rendering Cemeteries with LibreCAD and Blender | Photo Restorations by Tim G.
While on unintentional hiatus from my 52 Ancestors Challenge, I’ve discovered two fabulous software packages that might make my family history research a little more colorful: LibreCAD and Blender. These dicoveries came about last week as I fulfilled some Find-A-Grave photo requests at a tiny little hideaway called the Cheltenham Methodist Episcopal Churchyard. Of twenty-five photo outstanding requests, I managed to fulfill only three, and this is almost certainly due to the other other stones either not existing or being totally illegible. I thought I might do each photo requester a favor by mapping the locations of all the stones on this small patch of land and what inscriptions, if any, remained legible upon them. That way, each requester could rest assured that their requests had been fulfilled as well as can be. The Rowland, Woodhead, and Miller lots at the Cheltenham ME Churchyard, mapped using LibreCAD. My first instinct was to use a CAD program to draw the map. 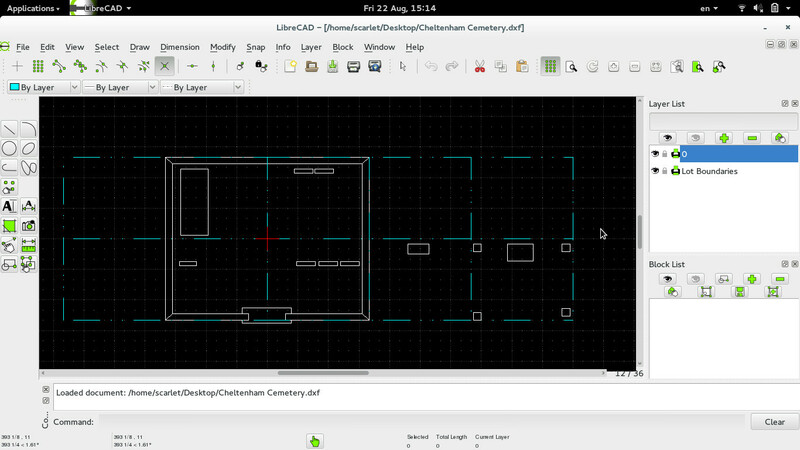 There are several free CAD programs for Linux. I went with LibreCAD because I read that it is among the more popular. It worked really well for it’s intended purpose, which is to make 2D precision drawings. Basically, you bring your measuring tape out to the burial site, measure the sizes and distances of things, and then draw what you see. Of course, you may add legends and labels to your drawing. Satisfied with the initial result, I investigated the next logical step: turn a 2D drawing into a 3D rendering that would simulate the feel of being physically present ant the cemetery. For practice, I started with my family’s lot at Holy Sepulchre cemetery in Cheltenham. I started by mapping a portion of it with LibreCAD. I then managed to import the CAD drawing into Blender, the free 3D rendering program. From there, I built up gravestone monuments from imported photographs. The Blender program is very powerful and has a steep learning curve (but see this). I would not recommend it for computer beginners, but upon asking the Googles a few thoughtfully worded questions and watching a few thoughtfully crafted YouTube videos, I was delighted with what I was able to produce upon three afternoons of tinkering. The sample above looks pretty decent to me, but there is so much left to learn. Eventually I would like to complete the scene with computer generated grass and a clear blue sky. Once I master that, I would like to create navigable 3D renderings of cemetery plots or even small cemeteries, like the Cheltenham Methodist Episcopal Churchyard. I could make these available to the public through online platforms such as Second Life. I recall once strolling through a replica of an old Scottish cemetery on Second Life, but I have been unable to find in upon recent searches. The most visible and popular cemetery now on Second Life is the Second Afterlife virtual cemetery, featured in the video below. This virtual cemetery memorializes both real life people and the virtual passings of online personalities. Users pay a fee to rent virtual plots using Second Life’s virtual currency. Once paid the users are free to design their own memorials. Another well crafted Second Life virtual cemetery is the Peace Valley Pet Cemetery. Technologically speaking, there is nothing to prevent moderately skilled computer users from using software such as Blender and Second Life to contribute to the building of virtual replicas of actual cemeteries and putting them on line for the world to browse. This could be the model of the Find-A-Grave of the future. One needs not be an expert Pixar animator to start building 3D models from cemetery photos. So—what are you waiting for? This is such a great idea! People I work with use CAD to map staging and rigging for concerts.. but I am way more excited about the way you are using it!